The Best, and Only Zombie Bowling Game I have Ever Played! The concept of Zombie Bowl-O-Rama is simple; a meteor crashes to the earth and causes zombies to rise from the grave and cause havoc in town. You, our hero; being a bowling expert decide that with your trusty bowling ball you are going to save the town when they raid the local alley. 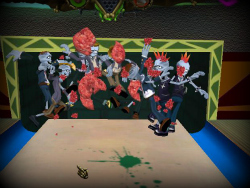 Zombie Bowl-O-Rama is the best zombie bowling game I have ever played, then again it is the only zombie game I have ever played, because it to my knowledge is unique. That alone makes it top notch in my book, any game that can be made in 2009 and be unique deserves some credit. Armed with a large selection of balls, including a severed zombie head, an arsenal of power ups, and more than a few chuckles at zombie expense, it is up to you to save the town, maybe even the world from the zombie invasion. Keep your balls from the gutters; knock over the undead, and save the day, and night from the walking dead. 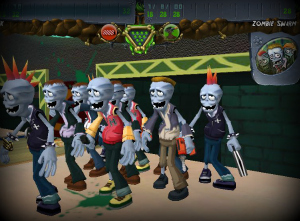 When I saw Zombie Bowl-O-Rama all I could think was "Crap, I have to play this for the site." So I picked it up and had a beer or two before firing it up. I was very happily surprised with what I found, after taking a couple minutes to fine tune my hand getting used to the simple but slightly touchy controls of the game, and figuring out what I was doing, it was a good bit of fun! I don't like bowling games, and I am rarely entertained by casual games; but lately I have been finding more and more that are little gems like this. Zombie Bowl O Rama is very much a casual game, bowl one maybe two games, set it down for a bit, and come back to it later. Unless you are one of those folk that sits down and beat casual games in one sitting like me with the insanely addicting Plants vs. Zombies. The controls take a little bit of getting used to, a hair over sensitive and twitchy, but the mechanics are solid. 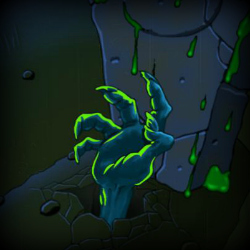 Zombies don't fall over like normal pins though, given that they are bodies with physics behind them; and some of the power ups are very over powered, like the barrier that can stop your, or your opponents ball dead (Ha!). Other power ups seem to have no earthly use or very, very narrow uses like the meat-ball, which makes you immune to only one of the traps your opponent can lay for you (water). The graphics are nothing amazing, the game is a 2009 release but it’s a low budget game as well, and they seem to have saved some money on the physics engine and the graphics. For what it is though it is a good bit of fun, though if you are looking for a 'true' bowling simulator; look somewhere else. If you’re seeking an entertaining bowling game, and really don’t care how 'real' it is, than this might just be for you. 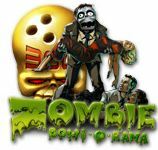 You can buy Zombie Bowl-O-Rama, or try it for FREE here, who does not want to play a free zombie game after all right? Go give it a try, and if you like it or not, come on back and share your thoughts with me, and the others on the review form below! Now, go out there and knock 'em dead!